Sri. Santosh Kumar Menon will elucidate the drishti Bhedas in this session. Kantam: Ta- Ka- ta-ki-ta (5 beats).. Perform step 1(Chatushram) and step 4(kantam) successively. Below is a video of Adi talam( Chatushra jati Triputa Talam having a total of 8 beats). Now try to use this and recite the natadavu or the mardhita in three speeds. Also try using your own hands to keep the time measure. Once you have understood this, you are ready to embark further on the panchanadai..
Once you have accomplished reciting the sorkattu for the adavu with the thalam, watch the following video which demonstrates a Mirdanga Vidwan,mr. Satish Krishnamurthy, reciting a korvai (or a rhythmmic sequence) for adi talam. This recitation of the rhythmic syllable is also referred to as Konakkol. Try to keep the Talam along with him. It may not be easy the first time. Dont give up, learning the knack of it will be a very satisfying experience. While we are learning the Panchanadai, it will do good to understand the Thalam in Carnatic Music. Bharathanatyam is traditionally set to Carnatic Music, and an understnading of the system will go a long way in ensuring a wholesome learning of the art form. Tala in Indian Carnatic Music is a time measure or rhythm cycle. As heart beat is to life for a man, Tala lends life for whole of a concert. It is said “Sruthi Mata Laya Pitha” which means, the drone emanated from the Tambura is Mother to the music and the Tala is like father. The tala or time in Carnatic Music is a series of counts made by wave of hand or tap of the hand on the lap or by using both the hands in a manner of clap. If we count a number each for every beat, fingercount or turn of the palm – the number comes to eight. So the tala has eight units. The units are called Aksharams and the Adi talam has 8 aksharams. The first part of the tala which consists of the beating of the palm & counting is called Laghu. Here the number of units is 4 (Chatusram) and the laghu is Chatusra laghu. The Jaathi of the laghu determines the jaathi of the tala so the tala is Chatusrajaathi Adi Tala. Thus, from the above, we understand that a tala has laghu, drtham and these are called Angams (parts) of the tala. In some cases, there may be half of drtham, i.e., just the beat of the palm without turning it and is called Anudrtham. There are seven basic talas in Carnatic Music: Suladi Sapta Talas The Seven Talas form the major oft used rhythms in Carnatic Music. Though there are many tala systems in Carnatic Music, the Suladi Sapta Talas are the most famous since the time of Purandaradasa (1484-1564) and most of the Compositions currently sung are part of the Suladi Sapta Talas. In a tala, the drtham has two units and anudrtham (if it is part of a talam) has 1 unit and this is a constant. But the units of the laghu vary according to the jaathi. Please visit our Orkut community Forum at http://www.orkut.com/CommMsgs.aspx?cmm=44961401&tid=5201146614654177109 for further study. If you did watch the previous video carefully, you would have observed a few variations in beats while performing the nattadavu. This is referred to as a varaiation in nadai. Nadai (meaning gait) refers to the rhythmic flow of the composition. Carnatic Music upon which Bharathanatyam is based, recognizes 5 basic nadais( Pancha nadais). Hence this adavu is also referred to as Pancha Nadai. Sankeernam (putting a chatushram and kantam together)-9 beats-Ta-ka-dhi-mi-ta-ka-ta-ki-ta. Each nadai has its own flow that can be harnessed to potray a particular mood or feel. These adavus are usually used as a wrap up portion of the end of sahitya (lyrics) portions in the varnam to enhance and emphasize the tempo and rhythmmic content. This is referred to as Thattimetti. 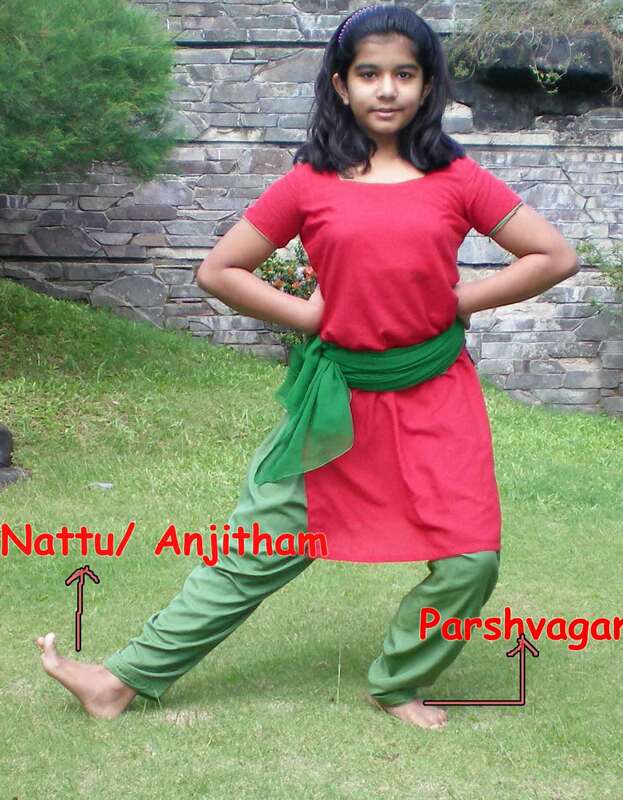 (Thaati-means to tap, metti- means to hit the floor with the heel while being rooted on the toes ). During the thattimetti , the dancer uses hand gestures and facial abhinaya to convey the meaning of the lyrics and simultaneously performs the relevant tattimettu (or an intricate combination). This requires a lot of concentartion and dexterity. In this clip the dancer performs a varnam . While for the first 20 seconds she mimes the songs out with gestures, you can see her perform the tattimetti from the 20 second onwards..(till around the 3oth sec or so). You may notice that the thattimetti performed in this particular clipping is set to 4 beat/chatushram. Four variations in neck movements are prescribed.